Resorts: The resorts have 24 hour standby generator, which runs on 220 volts US style 2 flat pin plug system. 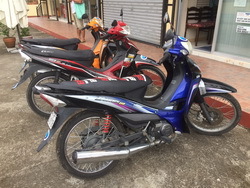 Security personnel is available 24 hour, resort activities like scuba diving, beach outing, snorkeling is whole year round because Philippines has only one season and that is summer. Monsoon rain is from July to October, Batangas temperature range from 24 C to 32 C. For general diving condition the best months is between November to June, July to October is rainy season but water temperature is more warm and visibility can reach up to more than 30 meters. Payments : Payment can be made generally in Philippine peso, US dollar and Euro are also acceptable. We accept cash or bank transfer and can be paid all upon check in or a day before check out. The resorts also accept major credit card payment for (room and board only) like Visa and Master card. We require a Php 7,000 deposit to make final confirmation. We accept secure online payment using credit card, debit card or Pay pal balance, the fast and easy way of making payment, just make sure you make final confirmation with us first, before making any online payments. Full payment online is suggested to avoid problems with carrying so much money with you. Bank Address: Along National Road, Poblacion, Mabini, Batangas. 4202. For All divers and students : Classes and fundives preparation normally starts about 8:00 am, 9:00 am starts the first fundive by boat, going out 2 dives and another dive or 2 dives in the afternoon which starts from 1:30pm to 2:00pm. For all guest (1 or 2 person) joining the group we encourage you to be here on preparation time 8:00 am , if you have a bigger group (3 persons above) or preferred a solo flight with just a guide then its ok, you can start anytime. 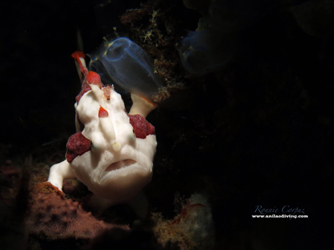 For addicted divers in Anilao, Mabini, Tingloy dive sites, you can easily do 3 to 4 day dives and 1 night dive. Ocean Conservation fee or marine sanctuary fee of Php 200 per diver per day is required by the Mabini Municipal government for all divers, intructors or divemasters. Have fun in Anilao. New August 15, 2018- All tourist (local or foreign) will now pay an Environmental or Conservation Fee of Php 50 per person upon arrival at Mabini. Policy : All payment for dive packages are non-refundable upon guest pick up or guest arrival at the resort. The package costs and arrangements cannot be diverted to any change in activities, another arrangements, materials or transferring it to a different persons. Any form of down payment, advanced payment with or without receipt are non-refundable and will be forfeited on no-show or on cancellation of reservations 1 week prior to the date of schedule. Unpaid packages and scuba dive courses that has been started already must be paid in full upon guest check out. Full amount of the package (online payment) will be refunded if the resort selected is full or no vancancy on the date you choose to reserve. If we caused the problem or due to unexpected calamity we will refund the package or prepayments in full or activity that was not done inside the package. Incase of calamity happen on the ongoing package we will refund the unused package 50%.